This is the book that made me start this series. And then there are books without iconic content or where the iconic content has yet to bubble to the surface and you get character pin-ups, scene illustrations, bland photographs, or weird abstract expressionism like you did with SF/F from a certain era. All of which brings me back to Hav. (I know I’ve used Hav and Last Letters From Hav almost interchangeably.) 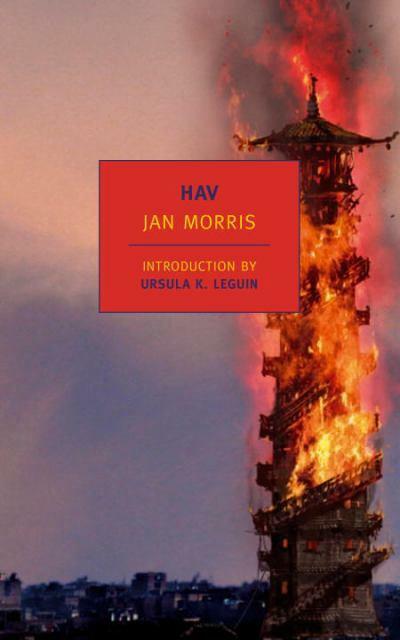 Hav is Jan Morris’s fictional travelogue to a country somewhere between Greece and Turkey. Morris made her name as a travel writer (best vacations a book can buy) and Hav largely reads as a straight travelogue until you remember she’s making the whole place up and using the country as … something … a metaphor or vehicle to write a memoir or critique of history or travel writing. It’s not really any one thing. So how exactly do you convey that? The maze with the train in it is pretty cool. As is that fantasy cityscape with the Chinese tower right in the foreground. That may look too fantastic but I love that cover. The later printings like the NYRB one (and others I haven’t included because they’re too similar) also feature the Chinese Tower but show it on fire. If you have no clue what the book is about and see that cover, you might develop expectations regarding the book, ones it is not at all likely to fulfill. Sort of the same way if a friend recommended A Scanner Darkly to you by saying “it’s about an undercover cop in the future who’s trying to take down a drug ring”, you’d likely be disappointed. 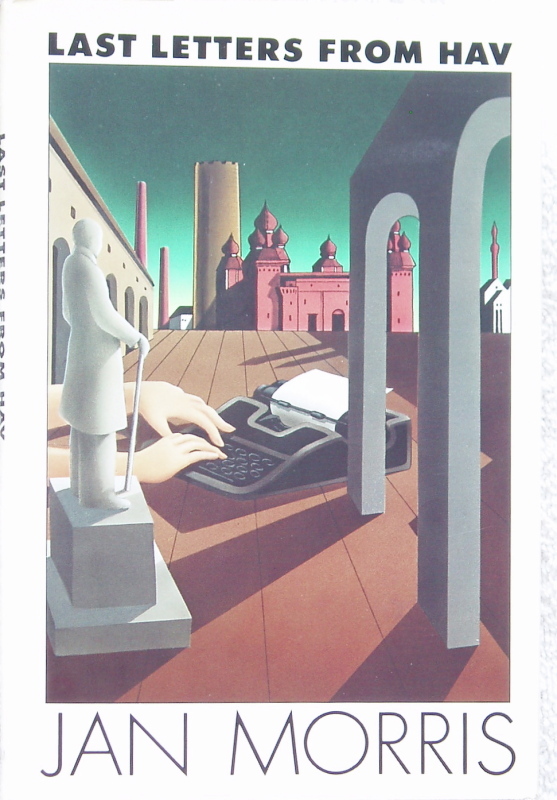 Maybe the cover with the De Chirico-esque city scape and typewriter does the best in capturing the book’s mood. What’s most weird about these burning tower covers is that they attempts to make an icon from one event out of many potential ones. 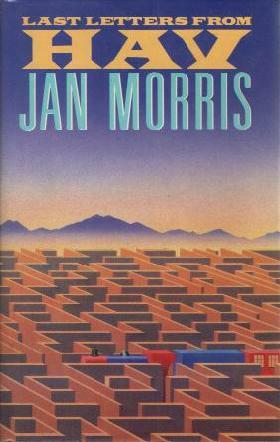 Is the maze race any less iconic, or the maze itself, or the sense of travel, or Mamoun’s trumpet, or the troglodytes and their snowberries? To picture that one event, the burning of the tower, to the exclusion of all others — well, I don’t know. Is that what the book is about? It’s not really what I think about when I think about the book. But what exactly are covers for then? To attract buyers? To signify that the book is X instead of Y? To signify that we are X-type person instead of Y-type? To keep the inner pages from falling out? And then when books get multiple covers over decades how are they packaged for new readers? 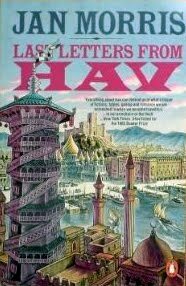 Looking at an old cover for Hav after seeing the new NYRB one made me wonder all these things, and that’s how One Book, Four covers got started. And now you know, etc. An interesting piece on Jan Morris and her struggles with academia over at Ridlerville. She took a lot of heat for becoming who she really was, despite being a war veteran, amazing historian and journalist, and wonderful writer. Rumours abounded that positions of influence in universities were denied Morris because of her journey from one gender to the other, that her life as a travel writer was in part a result of these challenges.